Notice how I put the book in the refrigerator for this picture? Pretty clever, right? If you read these Sitzbook reviews, you may have noticed that this year I’ve been reading more non-fiction than last year. That’s actually completely coincidental, but it’s a good thing, too. I like novels, but sometimes it’s nice to mix things up. Some people complain that non-fiction is dry or boring, but if you think that, then I’d point you in the direction of books like this one. My friend Brad, once again a source of great knowledge and even better book recommendations, mentioned this book when we visited him in Iowa in December. He commented about how the book looked at corn production in the US, and in particular focused on Iowa. It was a pretty eye-opening book in many regards, but the way it highlighted the sheer proliferation of corn-based products in American food –and not just high-fructose corn syrup, although that’s a huge part of it– was pretty amazing. The book makes a strong point that the farming and food production system in the US is destructive and self-destructive in the long term, and it just makes me wonder what similarities and difference there might be between the system there and the one in place here in Costa Rica. I imagine that one big difference would be the use of corn products and corn syrup, since Costa Rica has sugar plantations. Additionally, Costa Rica supplies a lot of its own rice and beans, and meat in the form of cows, chickens, and eggs. Although I don’t really have a strong desire to visit a slaughterhouse here, I have a feeling that it wouldn’t be as disheartening as one in the US, simply because the scale of such an operation must be a few orders of magnitude smaller here. Anyhow, I’d highly recommend this book. It took me a while to write the review even though I finished the book back in February. It did have a strong impact on my thoughts, and I find my self thinking of it even now when I buy food in the grocery store or sit down to eat. Maybe it just took me a bit longer to “digest” it, lame pun entirely intended. “Sometimes I think that all it would take to clarify our feelings about eating meat, and in the process begin to redeem animal agriculture, would be to simply pass a law requiring all the sheet-metal walls of all the CAFOs, and even the concrete walls of the slaughterhouses, to be replaced with glass. If there’s any new right we need to establish, maybe this is the one: the right, I mean, to look. No doubt the sight of some of these places would turn many people into vegetarians. Many others would look elsewhere for their meat, to farmers willing to raise and kill their animals transparently. Such farms exist; so do a handful of small processing plants willing to let customers onto the kill floor […]. Well, thanks for reading if you made it this far! If you have any comments or if you’ve read this book, I’d love to hear from you in the comments section. Have a nice day! 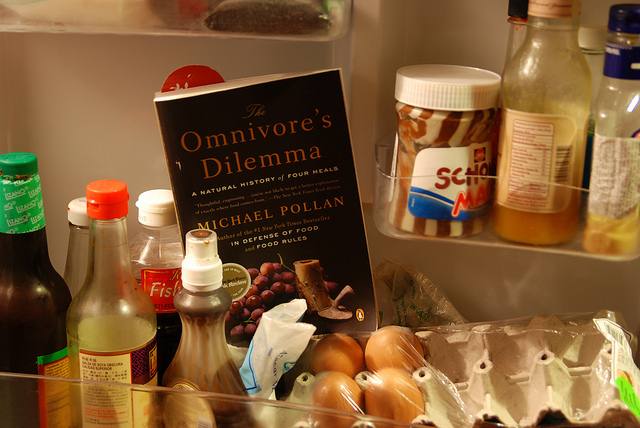 This entry was posted in Book, Dilemma, Food, Good, Michael Pollan, Omnivore's, Review, Sitzbook by Sitzman. Bookmark the permalink.